MagicRed Casino's Welcome Bonus doubles your first deposit up to €200. In addition, you also get to claim 100 free spins within 3 days: 20 with your first deposit, +40 on the second and third day of your dposits. Sign up for a new account and double your first deposit! Take advantage of the 100% first deposit bonus, which will let you play with €400 for a deposit of €200. 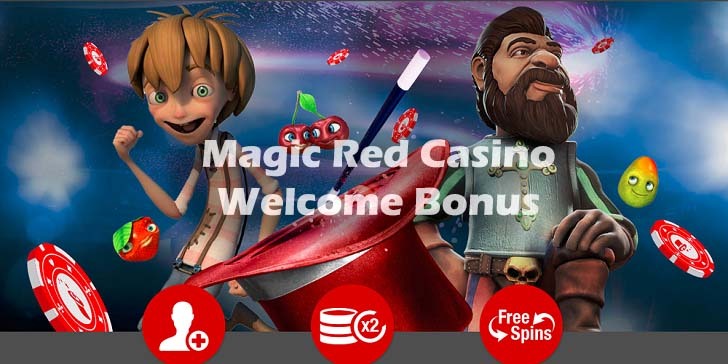 In addition, you get 20 free spins as well as your first deposit bonus at MagicRed Casino. On the second and third day of your first deposit, make another deposit for further free spins. You can claim a total of 100 free spins within your Welcome Package, throughout 3 days. Only new players can get this offer. The minimum depositing requirement is €20. You can claim a total of €200 + 100 free spins. You will face a 35 times wagering requirement. Learn more about MagicRed Casino.